The vacation you'll never forget - no matter how hard you try. Pack your bags for Club Paradise, the Caribbean resort where the good times and laughter come at you in waves. Academy Award winner Robin Williams steers their crazed course of this tropical romp as an ex-Chicago fireman who uses a sizable disability settlement to transform a remote island watering hole into a lucrative tourist waterland. Peter O'Toole, Twiggy, Rick Moranis, Andrea Martin, Eugene Levy and other comic cohorts cheerfully cavort (and Jimmy Cliff musically riffs) under the breezy direction of Harold Ramis for a lark that "The New Yorker's" Pauline Kael judged "as pleasant as can be." 1986’s Club Paradise firmly falls into the category of undistinguished but amusing. Director Harold Ramis’ follow-up to the successful Vacation, Paradise showcases Chicago firefighter Jack Moniker (Robin Williams). He tires of that life and retires to remote British protectorate Saint Nicholas. There Jack mingles with both the Brits and the natives. In the former category, he tangles with jaded Governor Anthony Cloyden Hayes (Peter O'Toole) and he romances tourist Phillipa Lloyd (Twiggy). In the latter domain, he pals around with Ernest Reed (Jimmy Cliff), the owner and operator of Club Paradise, a run-down hotel and bar. Ernest has problems. He owes taxes to corrupt Prime Minister Solomon Gundy (Adolph Caesar), and the owner of the upscale Royal Saint Nicholas Hotel (Brian Doyle-Murray) pressures him to sell his property. With the assistance of Phillipa, Jack helps Ernest spruce up Club Paradise and turn it into a tourist destination. That group includes woman-hungry sleazes Barry Steinberg (Eugene Levy) and Barry Nye (Rick Moranis), struggling married couple Randy (Steven Kampmann) and Linda White (Andrea Martin), and travel reporter Terry Hamlin. The rest of the movie follows a few tangents. We watch the adventures of the tourists but we also see the behind the scenes tensions. The authorities want to shut down Club Paradise and make drastic changes to Saint Nicholas that will negatively affect the locals. Jack and Ernest lead the way against these incursions. Usually I complain when a movie lacks a coherent story, but Paradise stands as an exception. The movie’s main flaws come when it stresses its plot. With the ridiculous amount of comedic talent on hand, why in the world does the film bother with some warmed-over tale about island revolution and big business? Those quickly turn into fast-forward moments, as it becomes tough to keep away from the remote whenever they appear. This means Paradise doesn’t really start until the tourists arrive. Williams provides a few good comedic moments prior to that point, but only when the others get to the island does the film truly become interesting. The first 20 minutes acts as little more than set-up to get to the meat of matters. And the parts that focus on the tourists don’t disappoint. I once thought that performers like Moranis, Levy, and Martin could do no wrong, but they've proven me incorrect with a succession of lousy vehicles over the years. However, in this flick, they fire on all cylinders. Paradise bears a stronger SCTV pedigree than almost any other movie. Ramis was a charter member of the show, and Moranis, Levy, Martin, Joe Flaherty and Robin Duke all served as regulars at one point or another. Heck, Williams even guest-starred on the show! The chemistry among this group gives the movie its best moments. Levy and Moranis provide most of the laughs with their nerdy wannabe hipster lotharios. Levy’s simple mispronunciation of “sandwich” as “sangwich” is amusing, and it’s hard to resist many of Moranis’ lines. I love it when he refers to hot women as “good knish”, and I adore his description of Club Paradise as “all Preparation and no H!” God knows I’m sure I’ll steal those lines for my own use. The others provide plenty of great comedy as well. This means Paradise soars in its second act. That portion does little more than showcase the actions of the tourists as they toddle around the island. The third act involves itself too heavily in the main plot, so it fizzles pretty badly. Does one good act make a movie worth watching? In the case of Club Paradise, I’d say yes. There’s just enough entertainment in the rest of the flick to make it go down fairly easily, and the serious highs of the middle are wonderful. Paradise is an inconsistent mess of a film, but it offers more laughs than most. 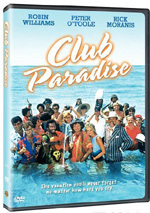 Club Paradise appears in an aspect ratio of approximately 1.85:1 on this single-sided, single-layered DVD; the image has been enhanced for 16X9 televisions. The transfer mixed highs and lows to end up as fairly mediocre. The main negatives came from dark shots. Shadows tended to be rather dense and opaque. A single nighttime shot with Cliff and Williams looked good, but the rest were murky and tough to discern. Darks were too heavy, and that applied to skin tones as well; the image often obscured the faces of the black actors. Otherwise, there was a lot to like about the transfer, though I thought sharpness was a little erratic. Occasionally wide shots came across as a bit tentative and fuzzy. Most of them were reasonably concise and distinctive, however. I noticed no jagged edges and only a little shimmering and edge enhancement. Colors sometimes demonstrated that trademarked Eighties flatness/denseness. However, the tropical setting and many daylight shots meant most of the hues looked very good. They only became murky during interiors, whereas the daytime images provided vivacious, dynamic tones. The movie seemed a little grainy at times, and it occasionally showed some specks and marks. These were more modest than I expected, though, so I didn’t think the print looked too dirty. While this never turned into a great transfer, it had its moments and remained satisfactory. To my surprise, the Dolby Stereo 2.0 soundtrack of Club Paradise worked pretty well. The quality of the music was the highlight. The flick featured a pretty solid roster of tunes, and they usually sounded great. The music offered nice definition and range, with clean highs and rich lows. Effects weren’t a big consideration, but they mainly seemed fine. A few louder bits like gunshots could be a bit distorted. Otherwise, those elements were clean and clear. Speech showed a smidgen of edginess for a few lines. Most of the dialogue was concise and tight. The music was also the strongest part of the soundfield. The tunes and score always offered very nice stereo imaging. Effects occasionally displayed decent environmental information, but they didn’t add a lot to the proceedings. Only a few scenes such as a storm at sea opened up the surrounds in a noticeable way. This was a modest track but it seemed pretty solid for a 20-year-old mix. Unfortunately, Club Paradise lacks any significant extras. We get the film’s trailer and nothing else. Although Club Paradise sputters and flares out on more than a few occasions, its terrific cast provides more than enough good comedy to make it work. You’ll find yourself somewhat bored during the first and third acts, but the middle section is so terrific that it easily compensates for the problems. The DVD presents decent picture along with pretty good audio and no substantial extras. This isn’t a stellar release, but like the movie itself, it’s good enough to merit a recommendation.